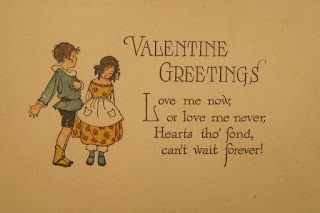 The Pendleton Genealogy Post: A 1923 Valentine's Day Card: "I'm tired of waiting"
A 1923 Valentine's Day Card: "I'm tired of waiting"
This Valentine's Day card postmarked February 14, 1923, is from my maternal grandfather William (Will) Liming Redles to my grandmother Martha Leona Roberts while they were courting (long distance much of the time). He was in Washington, D.C., and she was in Valdosta, Georgia. One of my grandfather's friends, Warren Graham, was married to my grandmother's sister, Margaret. 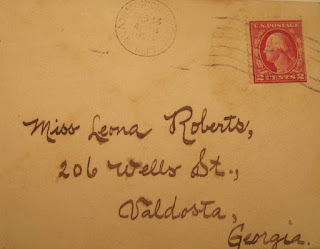 Warren sent Will a photo of Leona in about 1921, and Will fell in love. Even though he didn't sign the card, I recognize his neat, precise handwriting on the envelope. I suppose he was getting tired of waiting for her to declare her feelings for him. He sent three letters to her around this date saying as much. In one, he says he has something very important to say to her. He didn't have to wait much longer. They were married just over two months later on May 8, 1923, in Bryn Athyn, Pennsylvania. Happy Valentine's Day Will and Leona! Love these old Valentines, bringing our grandparents back to us in the youth we never knew. I posted one last year on 2/14 from 1942 from my mom to my dad (before married) and one from my grandfather in 1911 to my grandmother, posted 100 years after it was sent (2011) Check 'em out if interested. I see we have a WWII connection too. I'm posting the letters to and from my uncle starting with a photo from his draft date, Jan. 23, 1943. Nice to meet another treasure-keeper. Hi Linda, I love reading through the old letters and cards. You're right. They let us into a part of their lives that we never knew. I went to your blog to read the Valentine's cards. How cute and sweet! I loved reading your grandmother's letter in response to your grandfather's Valentine. I've thought about posting my dad's WWII letters like you have done with you uncle's. I've finally finished scanning them all (well, all the ones I've found so far). Now I need to get busy reading them. I love the valentine. So sweet. I'm happy to know see returned his love. Very nice. I think it is astounding that your grandfather fell in love spurred by a photo! And I enjoy this insistent Valentine's day card. His handwriting is like calligraphy, very artistic. Thanks!